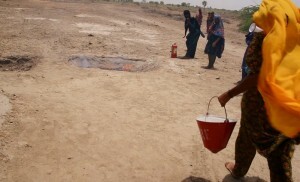 Community World Service Asia, with the financial support of Christian Aid, has been working with flood-prone and affected communities in Thatta, Sindh since 2010. Along with utilizing our innovative Mobile Knowledge Resource Center to conduct interactive training workshops to support community members, teachers and students to become disaster resilient, we promote community ownership of disaster risk reduction initiatives through the formation of local level disaster management committees. These committees are essential to the active participation of communities in preparedness and mobilization in the event of a disaster, as well as building sustainability of the intervention. The committees carry out assessments of local risks and capacity to respond, as well as producing hazard maps and conducting evacuation drills. On June 15th, members of the disaster management committee in Union Council Bijora, Thatta participated in an exposure visit to a neighboring village, Ali Muhammat Jat, to share their experiences of working to build community resilience to natural disasters. The visit was an opportunity for both communities to identify good practices and areas in which they can learn from one another. The participants shared the importance of engaging and coordinating with community members in order to successfully identify needs and priorities, and effectively sensitize communities to important practices such as education and disaster preparedness. The committee in Ali Muhammad Jat, supported by Islamic Relief Pakistan, also shared their initiative of monitoring local news alerts to develop their own early warning system, which the committee members from UC Bijora found particularly interesting and useful. Exposure visits like these enable the communities with whom we work to develop links with other groups, learn from them, and adapt relevant initiatives to strengthen their own practices. This also helps the committees which we establish in becoming self-sustaining and durable in the long-term.